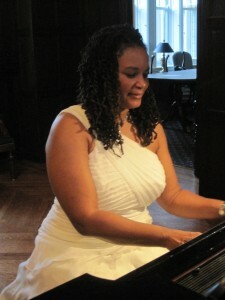 Today’s fine arts event was a performance by Karen Walwyn in the mansion from 3 to 5 pm. She is a pianist, recording artist and professor at Howard University. As a child her parents had her learn the piano and do several recitals. Later, when it came for her to decide on a career path, she decided to continue what she already knew which is piano. As an introduction, Dr. Walwyn played selections by Frédéric Chopin and then played her own composition “Reflections on 9/11″ inspired by the tragic events of that day. The piece is done in seven movements and each title represents the thoughts of each movement corresponding to the 9/11 attacks. The final of the seven movements represent hopefulness. “Hopefully the piece captures some emotion and expressions of that period in time.” Walwyn said. “Reflections on 9/11″ showcased a lot of tension and anguish. Her performance was breathtaking and really draws you into the music. This entry was posted in College and tagged Cabrini College, Karen Walwyn, Performance, Piano, Reflections. Bookmark the permalink.